Why Choose Dr. Hubbard for CoolSculpting? If you struggle with stubborn fat in specific areas despite healthy diet and exercise habits, you're not alone. 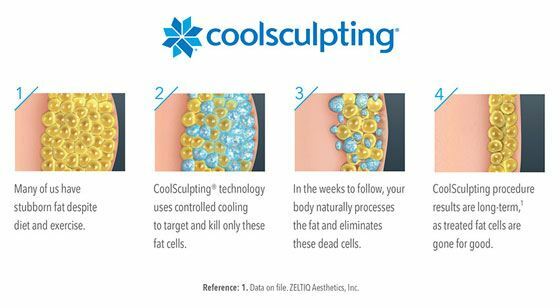 Developed by Harvard scientists, CoolSculpting meets the demands of millions of men and women by effectively reducing unwanted areas of fat without surgery, anesthesia, or needles. Dr. Thomas Hubbard is pleased to offer FDA-cleared CoolSculpting services to Virginia Beach patients who want to "spot reduce" when diet and exercise fall short. It's important to consult with a qualified plastic surgery practice such as Hubbard Plastic Surgery when considering CoolSculpting in Virginia Beach. Request a consultation online or contact our office by calling (757) 600-6227 to discuss your options. CoolSculpting is an excellent, proven option for helping many people reduce the bulges that bother them most, but it's better for some people than others. You may be a good candidate for CoolSculpting if you are at or near your ideal weight and bothered by smaller areas of excess fat. CoolSculpting is not a replacement for diet and exercise, nor does it create results as significant as those of surgical liposuction. However, for Virginia Beach, Norfolk, VA and Chesapeake-area patients interested in selectively reducing areas of unwanted fat, CoolSculpting at Hubbard Plastic Surgery can be an ideal solution. Why Our Military is Choosing CoolSculpting®? CoolSculpting is also often sought by military members looking to pass the mandatory "tape test." Often, despite being in good health and at an acceptable level of physical fitness, military members cannot reduce excess fat around their abdomens. This is often due to genetic predisposition, hormonal imbalances, or even age. In fact, many unpreventable factors can contribute to the localized accumulation of excess fat without having any marked effect on a person's overall level of fitness. Regardless, the military still requires waist measurements as part of their routine physical fitness evaluations, and it's important to adhere to their guidelines. Because our Virginia Beach CoolSculpting can result in a fat loss of about 20–25%, it's a workable solution for many military members. "I could not be any happier with Coolsculpting. I recently gained weight due to taking a pharmaceutical for a dental implant. I have always lead a healthy lifestyle so never had issues with fat on my body but I found myself in that dreaded place. I knew the only way to return to my former body was 2 hours a day of fat burning exercise and a very strict food plan. I have a career and find 2 hours a day is very hard. I did my research and Coolsculpting was "the path I chose". I could not be any happier with the results! I highly recommend the procedure for anyone, and yes the photos are real! It works!!" Can I Use CoolSculpting to Treat a Double Chin? The CoolMini applicator has now been specifically cleared by the FDA to minimize submental fat. CoolMini is designed to fit under the chin, and it uses the same patented Cryolipolysis® process as all CoolSculpting treatments. The CoolMini is the most advanced noninvasive fat reduction treatment dedicated to smaller areas, such as the chin. In a private treatment area, a qualified member of our medical team places a cooling gel pad over the area to be treated. This gel pad helps regulate the temperature of the device and improve conduction to the targeted fat cells. Your practitioner then places the CoolSculpting treatment applicator over the gel pad. Depending on the area you want to target, different treatment heads may be used. For areas of bulging, "pinchable" fat, such as on the abdomen, the treatment head uses suction to pull the bulge between cooling plates. For "non-pinchable" areas, such as on the outer thighs, the treatment head is strapped on, and a cooling plate presses firmly against your skin. Once the device is turned on, you feel an intense coldness as it begins freezing your fat cells. This sensation is typically short-lived as your body adjusts to the temperature. Most describe the numbing sensation as similar to using an ice pack. There is a little discomfort, minimal swelling and there could be possible bruising and some redness which lasts a matter of minutes, occasional numbness, and a bit of tenderness afterward. All these side effects are mild and short-lived. Am I a Candidate for a CoolMini Treatment? CoolMini treatments are effective in men and women of all skin colors and types, and a variety of ages. Each CoolMini treatment lasts 45 minutes. With the new technology represented in the CoolAdvantage applicator, which is used primarily for the abdomen, flanks, and inner thighs, the treatment time is down to 35 minutes per area. During your treatment, you're free to browse the Internet on your tablet or phone, read a book, catch up on work, or use the opportunity to relax. What can I Expect after my CoolSculpting Procedure? Immediately following your CoolSculpting procedure, you're free to get back to your daily life, whether that means hitting the gym for a workout, heading back to the office, or running errands around town. Your treated areas will likely be swollen and pink or slightly red, but can be easily concealed beneath your clothing. You may also feel some soreness, similar to the discomfort you'd experience the day after a thorough workout. Bruising is possible but not common and the area can feel numb. These symptoms usually subside over the course of a few days. The results of your CoolSculpting treatment take some time to develop. As the damaged fat cells are filtered out of the body, a process that can take 3 to 4 months to complete, you'll notice a gradual fat loss in your treated areas. If you adhere to healthy diet and exercise habits, you can maintain the results of your CoolSculpting treatment for many years. 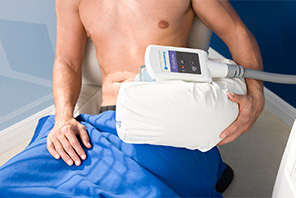 CoolSculpting uses a controlled cooling technique called Cryolipolysis® to freeze unwanted fat cells selectively. Because fat freezes at a higher temperature than other tissues, Cryolipolysis doesn't harm skin or muscle. A CoolSculpting treatment targets only fat. Once the fat cells are frozen, they die in a natural process called apoptosis. They are then filtered out of the body by its natural lymphatic means. No, not directly. Although excess fat can exacerbate the appearance of cellulite, it's not solely to blame — which is why the condition can be so tricky to treat effectively. Cellulite is the product of bands of connective tissue pulling on the skin from below, causing a dimpled appearance. How many procedures do I need to undergo? Most patients require two treatments. You're free to pursue additional treatments if you'd like further fat reduction. Keep in mind that your results can take up to 4 months to completely develop. If at that time, you wish to undergo additional treatment, our staff can help you understand the results you can expect. Can I choose CoolSculpting instead of a neck lift? With the CoolMini applicator, CoolSculpting can reduce the neck fat that can cause the appearance of a double chin. Patients considering neck lifts, however, are likely bothered by loose, sagging skin in addition to excess neck fat. A good candidate for CoolSculpting — under the chin or anywhere else — has skin that retains most of its elasticity, so that it can retract to fit the new, toned contours. Our trained staff will discuss all of your options during your consultation and show you photos of our patients from Norfolk, VA, Chesapeake, and Virginia Beach.